Hollywood films aren't renowned for their historical accuracy. "Never let the truth stand in the way of a good story" the saying goes. 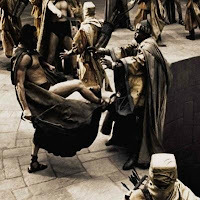 I have to admit that, inaccuracies aside, the film 300 is one of my favourite action movies. I won't waste time pointing out all of the film's ahistorical content, but there are some elements of truth to it. For example, one scene dramatizes the training Spartan boys underwent beginning at approximately age 7 or 8. Spartan boys were, in truth, sent to the agoge (a-GO-ghee) for a brutal and rigorous "education" which focused on military discipline, physical endurance and duty to Sparta. The constant military drilling, and the physical violence the boys suffered ensured that when they "graduated" at 20 years old, they were ready to become part of the most feared army the ancient world had ever seen. Laphroaig is much like the agoge. It can be brutal and demoralizing to those not prepared for its bold and unforgiving nature. And like Leonidas shouting "THIS ! IS ! SPARTA !!" at the messenger who threatened him and disrespected his queen, Laphroaig 10 Year Old Cask Strength is merciless and it will kick the unprepared or impudent into a bottomless pit. Luckily, if you like Laphroaig 10 Year Old, as I do, the Cask Strength version will prove itself battle-ready. Laphroaig is unapologetic. Their whiskies aren't for everyone and their cheeky marketing reflects this brilliantly. Their promotional videos emphasize the truth of their slogan "Opinions Welcome"; at one point in this one, a man says "That's good" to which the woman standing beside him replies "No, smells like sweaty workmen and tar." At the end of the video, an old Scot says "would ya really like ta know? It's like a Highland cow's horn up your arse." 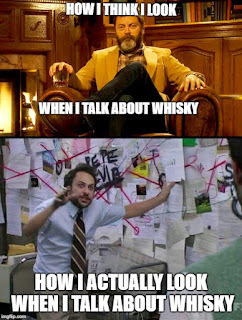 Many whiskies divide opinions, but Laphroaig seems to be the most divisive of all. 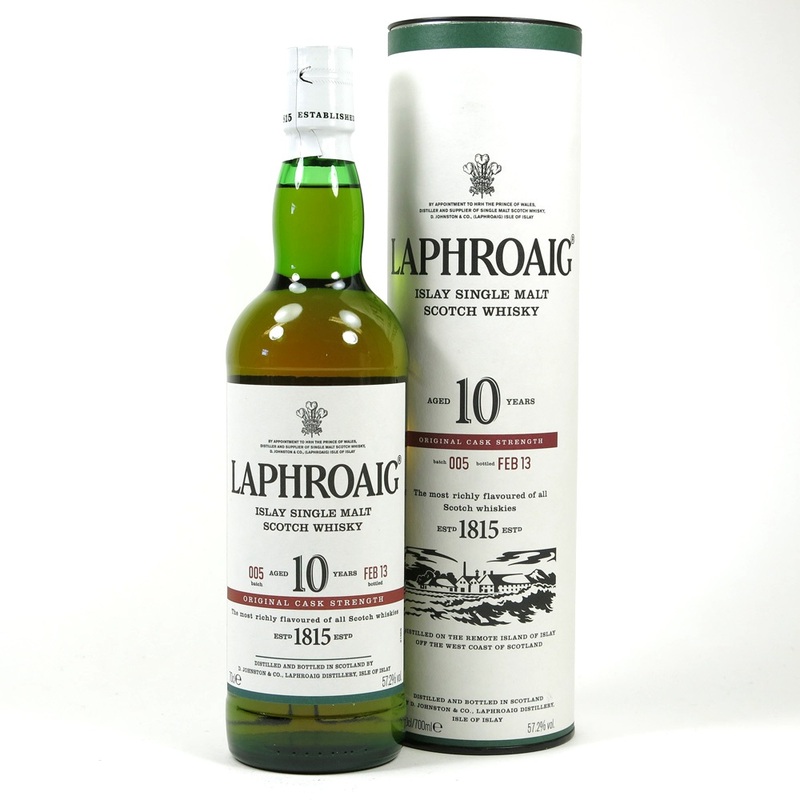 Laphroaig 10 Year Old Cask Strength is not readily available in Ontario. I was fortunate to obtain a sample from a friend for this review. This sample is from Batch 005 (57.2% ABV). The bottle was opened May 20, 2017, gassed after each use, and was 2/3 full when the sample was poured on Nov 5/2017. Nose (undiluted): very briny (sea salt), the seaweed (iodine) note is front and center, with the smoke hanging around in the background. There's also a rich vanilla note. With time in the glass, the smoke becomes more pronounced with a mineral note appearing as well. A bonfire on a rocky beach. Later still, aromas of salted caramel start competing with the smoke. The nose has a great development. This is how scotch should smell. Palate (undiluted): surprisingly sweet arrival, very friendly for a 57.2% ABV whisky, rich earth, ashy peat, some restrained black pepper notes with the salted caramel popping in again. Finish: long, sweet and earthy, black pepper returning with a medicinal, menthol and iodine note lingering. Hints of barbecue smoke (meat). I don’t want this to end. Adding water made the nose far more medicinal and antiseptic. The smoke retreats a bit before coming back and bringing the salted caramel along for the ride. The vanilla aromas are toned down with the addition of water, but a ripe pear note I often find in Laphroaig pops in. The arrival in the palate is actually hotter with the addition of water. Black pepper comes forward but retreats quickly as the sweetness comes back, which develops to a rich, thick cigar smoke. The finish becomes less medicinal with the addition of water. The earthy peat dominates the finish with some briny seaweed hanging around. This might be, to my tastes, a perfect whisky. It is on par with Lagavulin 12 Year Old Cask Strength in my books. This is great with or without water. There is so much going on with this whisky. It's a shame it isn't more readily available in Ontario. This is not a session whisky; rather Laphroaig 10 Cask Strength is a whisky to linger over and savour. If I had a study with a fireplace, floor-to-ceiling bookshelves and a large, leather chair, Laphroaig 10 Cask Strength would likely be my whisky of choice whilst I pondered whatever people with those studies ponder. This is a magnificent whisky for those of us who love big peat, iodine and smoke. Very highly recommended.